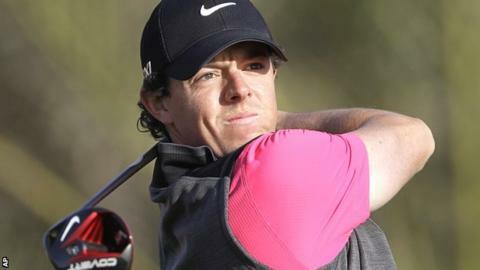 World number one Rory McIlroy suffered a difficult start to his 2013 campaign with a three-over-par 75 in the first round of the Abu Dhabi Championship. The 23-year-old, in his first event since November, was playing with new Nike clubs but had two double bogeys, driving out of bounds at his third. Playing partner Tiger Woods birdied three holes out of four around the turn before finishing with a bogey for a 72. Welshman Jamie Donaldson and England's Justin Rose lead at five under. McIlroy and world number two Woods were joined by former world number one Martin Kaymer in an illustrious three-ball, the third group off from the 10th tee. The German, now ranked 28th, has won this tournament three times and produced the best score from the trio, with four birdies in a 71. McIlroy, who won five titles last year including a second major with victory at the USPGA Championship, signed a lucrative new contract with Nike in the close season and was part of an extravagant launch in Abu Dhabi prior to the tournament. He began well at Abu Dhabi Golf Club, holing a curling birdie putt from 14 feet at his fourth hole, but his problems began on the 15th, his sixth, when his tee shot went out to the right, his chip out stayed in the rough and he missed a five foot bogey putt. At his ninth, his second shot with a fairway wood hooked violently behind the hospitality marquees and his second double bogey came at his 12th when his ball ricocheted off a tree and finished in a car park. The Northern Irishman, who finished second in this event last year, one shot behind winner Robert Rock, insisted his modest first day score was not due to the new clubs and said: "I was really happy with the way the ball is in the wind. Really happy with the irons, the wedge play. I wasn't very comfortable off the tee, but just because I didn't feel like I was swinging it that well. "It wasn't quite what I wanted, but it's a case of going and working a little bit on the range this afternoon and hopefully going out tomorrow and playing a little bit better and making the weekend. "It's a little bit of a experimental period and I've got four weeks off after this tournament to get used to it, but I feel if I can swing it a little better I can still have some good rounds here." Woods, joint third here last year, astonished the galleries with a mis-hit at his 10th that travelled barely 120 yards and did not reach the fairway. He holed a superb downhill putt from the edge of the green at his sixth and recorded his fourth birdie of the day at the penultimate hole to get back under par, but at his last, after a perfect drive, he pushed his second shot to the edge of the green and took three putts. "I'm right there," said the 37-year-old American, who won the last of his 14 majors in 2008. "If I had two-putted the last I'd have been 12th or 13th, something like that. "There are not a lot of guys going low out there. You seem like you're banking up against the wind pretty much all day. "It's tough - these fairways are tiny to begin with and there were a lot of crosswinds. I don't think it's supposed to blow as hard tomorrow, at least that's the forecast. The rough is deep enough where it's tough to get to the green. It's imperative to get the ball in the fairway." Donaldson, the Irish Open champion who will make his first Masters appearance at Augusta in April, holed from the bunker for one of his six birdies and said: "I was more often than not in the short stuff, which you need to around here. The rough is very penal." World number five Rose, playing the event for the first time, also holed from the bunker and after dropping a shot at the first had six birdies in the next nine holes en route to a share of the lead. Ryder Cup captain Paul McGinley had two double bogeys in a 76, a score equalled by former skippers Colin Montgomerie and Jose Mara Olazabal, while a former vice-captain, Darren Clarke, bogeyed seven of his inward nine holes for a 79.